Are you looking for an easy way to make Rice Krispy Treats without heating up the kitchen? Our Crock Pot Rice Krispy Treats are a great way to make your favorite childhood dessert without having to stand over the stove. And, with one simple trick, clean up is a snap! This method is great for travel, cooking with kids and anyone who needs a treat without access to a kitchen. I highly recommend using a silicone slow cooker liner! It makes clean up a snap! 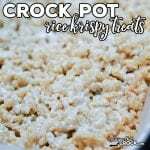 Making rice krispy treats in your slow cooker is great for when you are traveling, don't want to stand over a hot stove or when you don't want to heat up the kitchen!